Huddersfield RU dropped closer to the foot of the National II North table following a 38-24 home defeat at the hands of league leaders Macclesfield. On a day where conditions played a factor, the rain and wind made life difficult for both sets of players. The home side started the game well and took the lead through the boot of fly half Chris Bell, who converted an early penalty. The scoreboard looked even better for Huddersfield when Elliot Hodgson side-stepped the Macclesfield full back to go over in the corner for the first of his hat trick of tries. Bell again proved to be reliable with the boot. 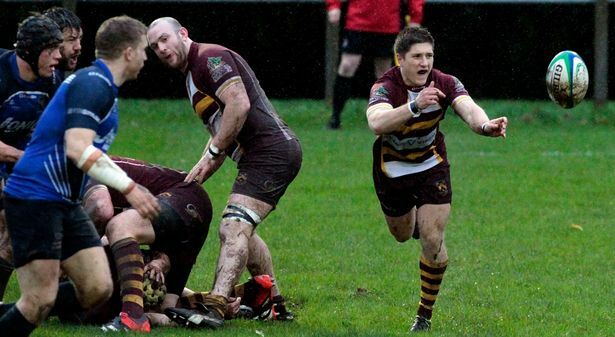 Macclesfield began to adjust to the conditions, and scored a try of their own through Rhodri Mayor. However, Lewis Barker was unable to convert. With the momentum of the game shifting between both sides, it was the turn of Huddersfield to score again. Some neat ball handling, and elegant footwork saw Hodgson score his second try of the game. Huddersfield RUFC v Macclesfield at Lockwood Park, Huddersfield. Bell added the extras with an impressive touchline conversion. Huddersfield were in control going in to the break, and half time seemingly came at a bad time as they were leading 17-11. The visitors came out firing in the second half and got their rewards, a try courtesy of Barker, and this time he added the goal. Huddersfield barely had time to gather their thoughts before Chris Bell saw his kick charged down by Charlie Venables, who scored right under the posts. Pressure was beginning to mount on the home side, but Hodgson who outpaced his opposite winger to bring the home side back into the game, pounced on a classy chip into the corner. Huddersfield were now trailing by only a single point. Unfortunately the comeback was denied when Macclesfield scored another try – Barker again showing his importance by making a dangerous run before touching down in the corner. A lack of discipline, which has been a stumbling block for Huddersfield this season, enabled Barker add two more penalties to increase the visitors lead for a comfortable victory. Huddersfield: Lewis Workman, Nick Rawsthorne, Elliot Hodgson, Tom Owen, Tom Hodson, Chris Bell, Dan Jeffrey, Alex Battye, Lewis Bradley, Laurence Sanderson, Austen Thompson, Adam Malthouse, Nick Rhodes, Ben Hoyle, Nick Sharpe (c). Replacements: Adam Tamanis, Henry Walker, Joel Hinchliffe, Joah Bradley, Jordan Wood.